There is a growing problem today for small to medium sized businesses like yours that you may not be fully aware of. You are working with a cash flow model that is literally leaving money on the table. Your business is not cash flow optimized for getting you paid on-time, on your terms and without hidden fees. What if within minutes you could make one small change to your business which could add nine percent to your bottom line profit this year? This is a problem that we solved for ourselves which led us to reimagining what the future of payments could be for small businesses. The good news is that hundreds of accounting firms, digital agencies, IT professional services firms and other small businesses have been able to recover an average of five to ten percent of their profits simply by switching to BizPayO, the world’s first Cash Flow Optimization Platform. First let’s dig into the problems that most of our customers experience before using the BizPayO platform. Do any of these sound familiar? You don’t want to lose 3-4% of your sales by accepting credit card payments, so you’re ok getting paid by check. Many small businesses either accept the absorbent credit card processing fees or are forced to take the risk of slow customer payments by accepting paper checks just to avoid these fees. Sure you can shop around for lower fee providers but at the end of the day those low fee providers will find another way to make up for this by adding transaction and interchange fees. Smart businesses today no longer have to accept this and in fact can now accept credit card and ACH payments at zero net cost. Your clients “pay slow” or not at all. Simply sending an invoice and hoping that your clients pay on-time makes cash flow forecasting unpredictable and risky. And it’s disrespectful towards your good work. Even providing an online payment method gets underutilized because your engagement agreement or customer proposal doesn’t automatically link to a payment method. Every month you need to “chase down” clients for payment or spend yet more money having your admin or bookkeeper collect payment. Not to mention the friction caused in your customer relationship. When they do pay you need to match the payment to the invoice then finally manually key it all into your accounting program and confirm that it actually posts to your bank account. In this age of slow food and slow travel, slow payments do not make for a healthy business. You have no single view of your payments from initial engagement to when the payment actually hits your bank account. Fifteen manual steps that either you are doing yourself or hoping that your bookkeeper is staying on top of every month–and for every customer! An unnecessary amount of labor costs and time. Cash flow optimization is the process of automating these key tasks while saving you time and money in no longer having to deal with these drains on your time and resources. Anyone can throw a “Pay Now” button on their website and hope that not only it is clicked, but the payment is actually made promptly. To us hope is not a strategy. This is why we have completely reimagined not just getting paid timely, but what we call Cash Flow Optimization. In other words thinking through every step of your existing process and getting you to that nine percent additional bottom line profit that most of our customers experience. Cash flow optimization is going from little to no control over your cash flow process to a fully optimized cash flow experience. Let’s say that you’re an IT Managed Services Provider with $500,000 in annual business revenue. A half of your revenues are paid via credit cards ($250,000). Your business profit is approximately 30% and you pay a bookkeeper or billing clerk $15 per hour to manage your accounts receivable. 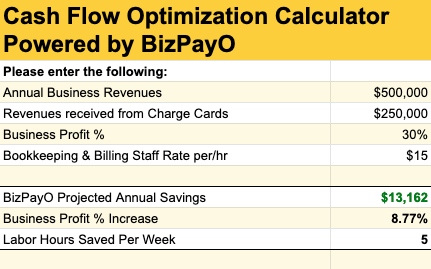 To plug in your businesses’ numbers and calculate your own savings you can download our free BizPayO Cash Flow Optimization Calculator here. Has an accounting system in place but no online one-time or recurring payments capability, no ability to recover fees, no customer engagements linked to payments and no automatic transactions synchronization to accounting software. No roles-based user access security. Has an accounting system in place, accepts basic electronic payments, no fee recovery, no customer engagement linked to payments, no automatic transactions synced to accounting software. Roles-based user access security. Has an accounting system in place, has electronic one-time and recurring payments capability, ability to recover fees, customer engagements linked to payments, and automatic transactions synced to accounting software. Roles-based user access security.